The Port of Valencia (Valenciaport) is a core port in the TEN-T network and it is a key Spanish node within the TEN-T core network in the Mediterranean corridor. Valenciaport is immersing in a process of upgrading its infrastructures and part of this process if formed by the CONNECT Valenciaport project. CONNECT Valenciaport is part of a global project aiming to improve Valencia’s Port interconnectivity by updating rail infrastructure, constructing a new access to the port (Northern Access) and improving maritime port accessibility for newer and larger vessels. CONNECT Valenciaport is a project co-financed by the European Union through the Connecting Europe Facility programme. The project addresses some of the most current and urgent problems affecting the infrastructures of the Port of Valencia. 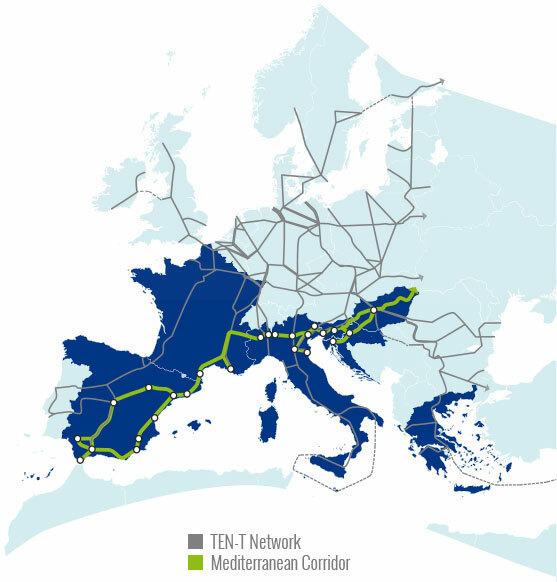 The main objective of this Global Project is to increase the capacity to operate trains coming from and leaving the hinterland of the Port of Valencia and increase its interoperability between the rail infrastructure and the Mediterranean Corridor. The project is divided into several activities that include infrastructure studies, works and also ICT tools and technologies, and concerns mainly the upgrade of the rail infrastructure to UIC gauge and the accommodation of trains up to 750 metres in length. CONNECT Valenciaport is well aligned with the objectives of the Mediterranean Corridor and it fits perfectly in the Strategic Plan of the Port Authority of Valencia which mainly aims to integrate the Port of Valencia into national and European infrastructure networks, contributing to the competitiveness of the industrial clusters located in its hinterland and to the European Transport Policy objectives. Improve the hinterland connections to and from the Port of Valencia. Connect the Port of Valencia and its terminals with UIC gauge tracks to the core network of the Mediterranean Corridor. Upgrading of rail infrastructure to accommodate trains up to 750m in length in the Port of Valencia. Upgrade and improve the internal rail network of the Port of Valencia. Increase the capacity to operate trains in the Port of Valencia as well as increasing the efficiency of train handling operations with new information systems. Improve safety and control of trains entering and leaving the Port of Valencia by eliminating level crossings.